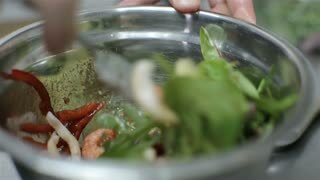 chef stirring vegetable salad with seafood. 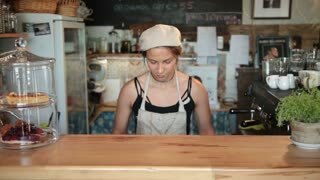 chef cooking a vegetable salad with seafood. Close-up of chef hands cooking and preparing food in restaurant kitchen. 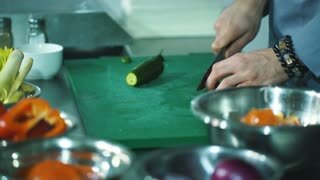 Hands of chef cutting zucchini. 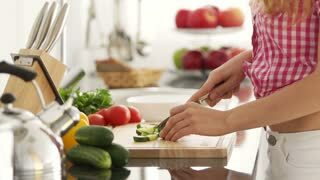 Sliced vegetable on cooking board. 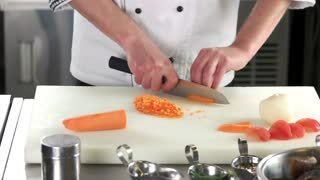 Hands of chef chopping carrot. Vegetables on cutting board. The chef in the kitchen of the restaurant prepares fish mackerel for the visitor. Lemon on the cutting Board.